This is my first welding project. 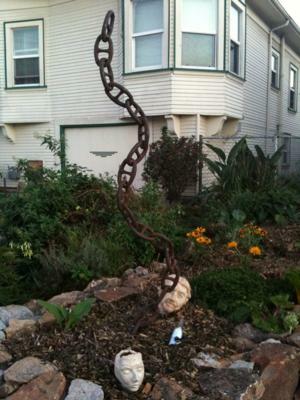 I just welded links from an old anchor chain in a curve, to look like it was growing out of the ground and to serve as a sculpture/trellis. I used a MIG welder. My main challenge was welding through the thick layer of rust. I salted the welds after to rust them to match the chain. thanks for the photo and description. I like it.